FilterPod systems consists of 2 stage separate FilterPod settlement tanks, or a single 2 stage septic tank, (which can be a suitable, existing traditional brick or concrete septic tank), followed by the FilterPod sewage treatment plant. solids exiting the tank and requires cleaning periodically, according to use. The settlement tanks digest most of the solids anaerobically and only require emptying every 1 to 2 years on average - the same as a septic tank. Existing traditional 2 stage septic tanks can also be used, if they are the correct size and watertight,as the settlement tank and in these cases you would only order the FilterPod sewage treatment plant. The Primary Effluent then enters the FilterPod sewage treatment plant which uses alternate layers of air passages and RDX media contained in nets. This RDX media is in constant contact with the air to treat the effluent in exactly the same way as Nature treats effluent in the soil or on the margins of a pond. Effluent is spread by way of an alternately tipping tray - no holes to block as with other systems. Bacteria grow in the RDX media and digest the organic material as it is trapped in the matrix and the cleaned water trickles through. We tell the truth. OUR RDX media, as with ALL non-electric treatment systems, is NOT self cleaning and under correct use the system will run for 8-10 years before the media pack requires replacement. As with other filter systems, the top layer of filter media bags require replacement every 12 months, though our media is only £40 + VAT for a box of 8 bags. This replaces the whole top layer and is 80% cheaper than that of its rivals. Sensible care must be taken to ensure that excess fats, oil and grease (FOG) are kept out of the system as far as is possible as it will clog the FilterPod media and the plant will not work. Non-electric, natural 'chimney' venting, described below. Solar powered venting using a 3 watt fan. No tall chimney required. Eco-electric venting using a 3 watt fan run on mains electricity. No tall chimney required. 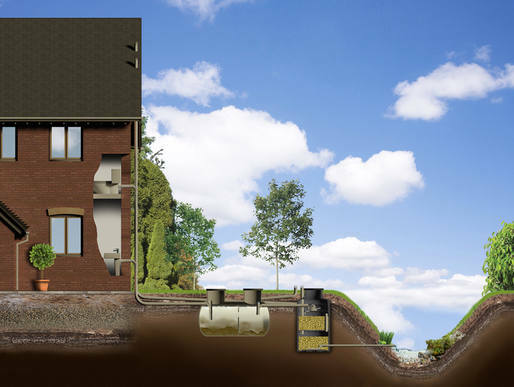 Instead of using electricity-guzzling compressors to provide the air, the FilterPod biofilter sewage treatment plant utilises the wind and natural 'chimney-draft' to pull the air through the plant with no electricity required. This venting of the system is essential in order for the FilterPod to work. 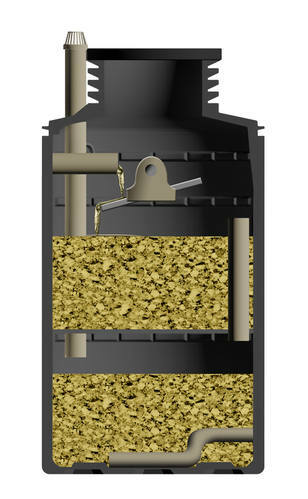 The low end of the chimney has its inlet within 5 metres of the FilterPod tank and the high end of the chimney usually exits underground and discharges within 10 metres up the side of the house or shed wall, telegraph pole, freestanding pole, etc. as a soil vent pipe. The high air outlet pipe must be 5 metres higher than the top of the air inlet pipe in order to 'draw' the air through the system, which is why it is usually fixed like the soil vent pipe - up the side of the house wall. A freestanding vent can be disguised easily by growing a Honeysuckle, Rose, etc. around it to form a very attractive feature. If you do not want high vent pipes, then the FilterPod can be vented artificially by way of a fan. This costs £5/year in electricity and can be solar powered if no electricity is available. If your outlet pipe is too low, you can fit a pump station after the FilterPod to raise the effluent. These cost about £1/person/year to run. The PRIMARY TANKS are included when you order the FilterPod sewage treatment system package. These are also vented to a separate soil vent pipe (it is often possible to use the existing SVP - see the drawing) and therefore no smell is emitted from the tank. Note, there is one vent pipe from the FilterPod and another one from the settlement tank. You cannot vent both through one 'chimney'. The final effluent can be discharged either to a soakaway or a watercourse. Never let anyone who is untrained on the FilterPod system undertake any maintenance on your plant. Unless the FilterPod is serviced by qualified FilterPod service engineers, your warranty will be voided. We have seen many extremely stupid things done to the system by so-called 'service engineers' and 'drain experts' and these are likely to result in having to replace the entire RDX media. The tanks themselves have been designed for UK site conditions. There is an installation manual that covers standard dry and standard wet ground conditions. You also need a slightly sloping site as the outlet from the FilterPod is 1800mm below ground.